Blessed are You Our Lord. Winter is here and we are preparing for the continuation of the Project: Spreading the Warmth work for the 2nd year. Last year during the winter season under the Project we raised about 1300 USD out of which more than 530 people were given winter clothing. We bought sweater, blankets to distribute among the homeless children, men and women, handicap beggars on street as well as elders. Part of the money was also used to help poor in emergency need (such as medical treatment). Last year most of the funds were raised from here, Inspirations and Creative Thoughts site, all thanksgiving are to God. With your generous donation it was a success to reach many who would otherwise suffer in long winter nights, living without much to cover them. Our location of distribution was central area of Dhaka, Bangladesh. Also my friend Priya in Kolkata, India joined the forces. She has already made small quills for infants and distributed among poor patients in hospitals, God bless her work. This year also part of the fund-raising will go to her for greater reach. How Spreading the Warmth Project Works? I have contracted a supplier who knows the cause and supplies me blanket and warm clothing at a bulk (cheaper) price from the local market. He delivers the supply at home from where I generally go out at night, identify those who are in direct need and clearly have lack of warm clothes / blankets to cover them and distribute among them case by case basis. I try my level best to reach out to those first who have next to nothing to protect them from harsh winter. For this generally it takes some survey of the areas to identify the appropriate and potential recipients.The clothes are given directly to the recipients without any other media in between. A majority of the contribution are done by online donation at this site. This year also I will be using ChipIn and Paypal to securely collect the donation. You may pay via International Debit / Credit card. Kindly spread the words and encourage your friends to contribute and do their best in their area as well. Local friends and well wishers also contribute directly. This year also I am putting up collection box in my local area for donation of old / used winter clothes. Contact me <mysticsaint@gmail.com> for Bank account details if you wish to do Bank Transfer. Think universally, act locally is an appropriate model for our time when we may reach out to any part of the world to alleviate suffering of human beings. 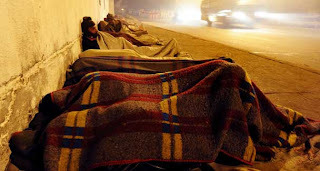 If you have poor people in your area, if there are homeless people who don't have sufficient warm clothing in this winter, its better to take care their need. You neighbors have a greater right that they receive your kindness. This winter try your best to at least reach 2 or 3 or more people and buy / provide them winter clothing (yesterday was my birthday and this is my birthday wish that you may also spread the warmth to at least few poor people). If you don't have any in your neighborhood you may donate here as well. Your contribution reaches directly to those who are in need. There are infants, very young children living with their parents as well who need the most protection against winter, else their lives are at risk. 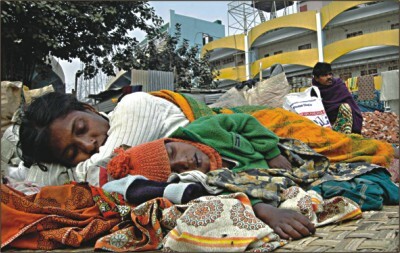 The blankets we buy for them goes to cover a number of family members. O Children of Adam, in the world I was laid unclothed and you didn't clothe me. The entire creation is God's family, because it is God Who maintains it; so that person is dearer to God who does good to His Family. In the spirit of generosity in this month of Pilgrimage and Sacrifice (Hajj, Qurbani), those of you who wish to make a donation, this is my suggestion that you donate it with an intention or a prayer that you are looking forward to be fulfilled in your life. By the Generous Face of Allah, al Karim, may your intention, desire and prayer be answered and manifest. and the glory of the LORD will be your guard. you will cry for help, and He will say: Here am I (Labbaik). Spend (in charity) out of the sustenance that We have bestowed on you before that time when death will come (to you suddenly), and he shall say: "O my Lord! If only you would grant me reprieve for a little while, then I would give in charity, and be among the righteous." - The Holy Quran, 63:10. The believer's shade on the Day of Resurrection will be his charity. In pre-eternity the angels asked God, "O Allah! In your creation is there anything more powerful than rock? God replied, "Yes, iron is harder than rock for it can split it." Then the angels asked, "O Allah! Is there anything more powerful than iron?" God said, "Yes! Fire is more powerful than iron, as fire can melt iron." Then the angels again asked, "O Allah! What is more powerful than fire?" God replied, "Water is more powerful than fire for it can put out fire." Then the angels asked, "O Allah! Is there anything even more powerful than water?" God said, "Yes, wind is more powerful than water for it can draw and give movement to water." Then the angels asked, "O Allah! Is there anything in your entire creation more powerful than the wind?" And God replied finally, "Yes! The charitable children of Adam whose giving of charity is such that his left hand is kept unknown from the right hand's charity, for they shall be victorious over everything." Whether you give openly or in secret, yours reward is with Lord. Give charity without delay, for it stands in the way of calamity (as a shield). That person's charity is best who has less wealth and who has obtained it by his own effort and from it he gives as much as he is able to. In India Goonj is taking a beautiful initiative by the title Ek Jodi Kapda. They have old / used clothing collection center. If you happen to be in India, please consider contributing and spread the work of Goonj. Visit the site of Ek Jodi Kapda. All photos in the post are taken from web / news media, no photos are taken during the clothe distribution as it may feel undignified to the recipients.